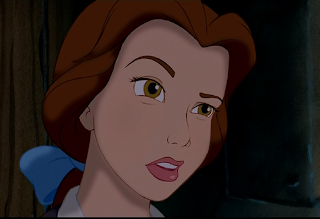 I could easily overlook Belle's beauty for her inner character. Somehow, there are other prettier Disney princesses but something about Belle magnifies beyond her good looks. It's the fact she's portrayed as a geeky, nerdy girl who loves reading. She is also a very kind person and she won't fall for the likes of Gaston. Although my only complaint is her lack of glasses... although it's possible she's a near sighted person. So how did that affect me? Remembering the time I played Harvest Moon: Back to Nature, my ideal bride was Mary. She's the librarian and daughter of the gardener Basil. So Mary dresses up like Belle and actually, she's quite pretty without her glasses. So pretty much, Mary in Harvest Moon is a girl whose nose is pretty much stuck in a book. In my case, I soon started to think of looking for girls who were bookworms. I always thought about it that it's hard to find a bookworm these days. I always thought that I used to search for Belle on the outside. What is important is to search for Belle on the INSIDE. I always thought about it that it's hard to find someone who's like Belle on the inside.